This page will include a selection of photographs of and about Freda Bedi from throughout her life, and more-or-less in chronological order. The photos are courtesy of Freda Bedi's family unless otherwise stated. This is Freda, with an elaborate bow in her hair and reading a book, along with her younger brother, Jack, and her mother, Nellie. The photo is clearly professionally taken. Nellie Houlston is wearing black in mourning for her husband, Frank, who died in northern France in the closing months of the First World War. Her pendant is a photo of her late husband. It's striking that none of the group are looking directly at the camera - indeed you can't see any of their eyes. Jack is wearing a young boy's sailor cadet's uniform bearing the name of Nelson's flagship, the HMS Victory. How remarkable that as an adult, Jack Houlston made his career in the navy. I would imagine that this photo was taken in 1918 or the following year, when Freda would have been seven or eight. In 1920 Nellie married again, to Frank Swan. Freda Houlston and B.P.L. Bedi announced their engagement early in 1933 - at the start of their penultimate term at Oxford University. This seems to be their formal engagement photograph. The Oxford Mail put news of the wedding in June 1933 - just days after the couple finished their finals exams - on its front page. ​As the paper reports, their engagement 'caused considerable interest' - or in Freda's words, 'a minor sensation'. This exceptional photograph shows Freda Bedi with no less than five future prime ministers. It was taken in the Kashmiri town of Sopore in August 1945, at the annual conference of the main political party there, the National Conference. It captures a remarkable constellation of political talent. The older man to the left of the tall, bearded man holding a child is Jawaharlal Nehru, who had just been released from jail and hurried to Kashmir where his daughter, Indira Gandhi, was staying. She is just to the right of the man carrying the child. And the youngster? Almost certainly Indira's son, Rajiv Gandhi, then just a few days short of his first birthday. All three became prime ministers, leading India for a total of thirty-eight years. The man holding Rajiv is Khan Abdul Ghaffar Khan, the most prominent Pashtun nationalist of his era, also known as 'Badshah' Khan and as the Frontier Gandhi; on the other side of Nehru is another leading political figure from the North West Frontier, Abdul Samad Khan Achakzai. On the left of the picture is Mridula Sarabhai, who later spearheaded efforts to retrieve the many thousands of women abducted at Partition. Behind Indira Gandhi is the imposing figure of Sheikh Abdullah, the commanding Kashmiri nationalist leader of his generation. Sheikh Abdullah's colleague and later rival, Bakshi Ghulam Mohammad, is standing behind Nehru. Both in turn became heads of government of the Indian state of Jammu and Kashmir with the title of prime minister (these days it's chief minister). Freda Bedi is shown on the far right. She is clearly pregnant - her son, Kabir, was born in Lahore the following January. Her husband, B.P.L. Bedi, is behind her, largely hidden from the camera. The couple next to them haven't been identified. My thanks to Ramesh Tamiri for alerting me to this wonderful photo - if anyone has a high res copy, please do let me know. 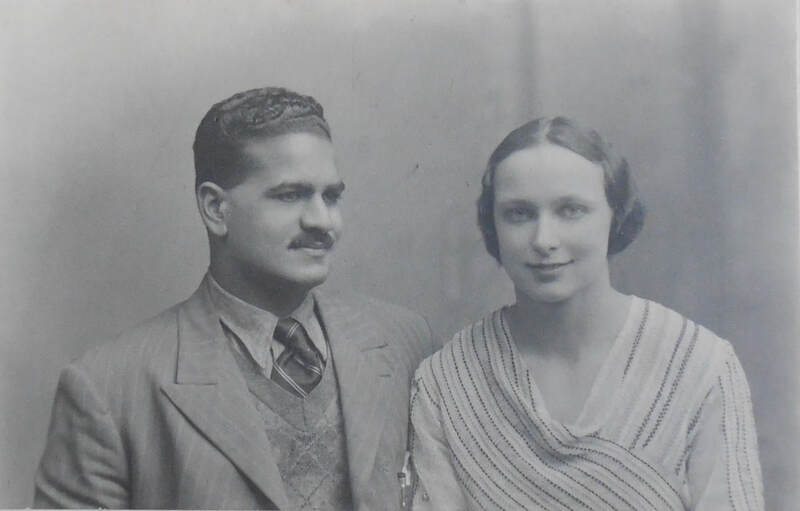 Freda Bedi travelled frequently to Kashmir from the late 1930s, and in December 1947 the family moved to Srinagar, living there for the next five years. Freda enrolled in a left-wing militia. 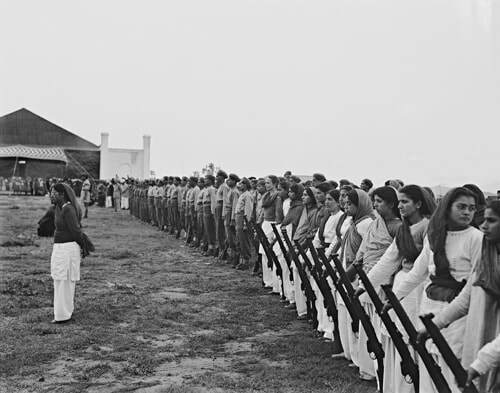 the Women's Self-Defence Corps, and this photo - courtesy of India Picture - dates from 1948. This historic photograph dates from 1960 and shows Freda Bedi at Misamari camp in Assam. This former military facility was hastily refurbished to serve as a temporary home for thousands of the Tibetan refugees who made the arduous journey across the Himalayas to escape Chinese oppression. The three young men holding books are (from the left as we look at the photo): Akong Rinpoche; Akong's younger brother now Lama Yeshe Losal Rinpoche and the abbot of the Samye Ling Buddhist centre in Scotland; and Chogyam Trungpa Rinpoche. 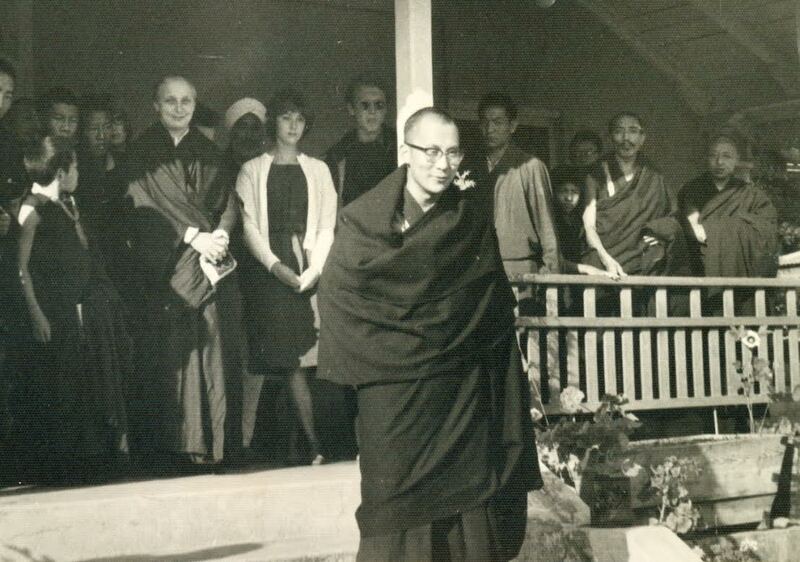 In 1962 or thereabouts, Freda Bedi took all the pupils and teachers - both Tibetan lamas and foreign volunteers - at the Young Lamas' Home School in Dalhousie to Dharamsala where they met the Dalai Lama. This photo is courtesy of one of the volunteers, Cherry Armstrong, who is shown here standing next to Freda. This photo of Freda during her years as a Buddhist nun - when she took the name Sister Palmo - was taken in Delhi in the late 1960s. The man behind her carrying a staff is Freda's husband, B.P.L. Bedi. ​You can see why Freda's blue-grey eyes were so often commented upon! Freda Bedi's guru was the 16th Karmapa Lama and the head of the Kagyu school, one of the four principal strands within Tibetan Buddhism. There was a powerful bond between the two. She persuaded him to reach out to devotees in the West, and travelled with him on a path-breaking five-month tour of North America and Europe. This photograph was taken at Rumtek monastery, the main centre of the Kagyu school.